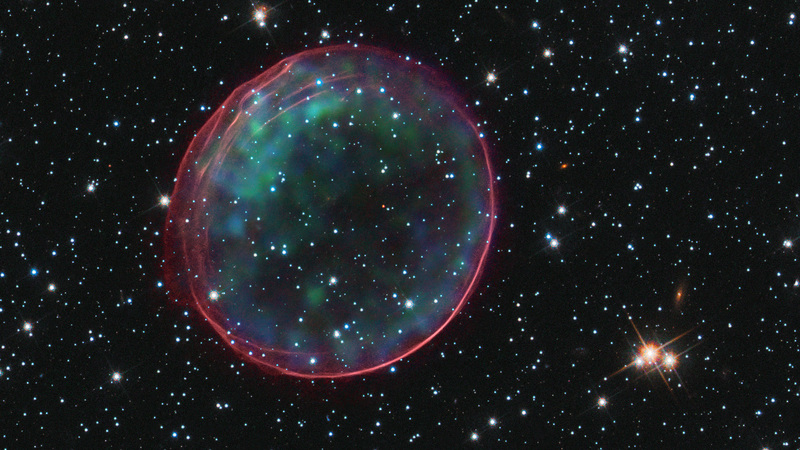 This delicate shell, photographed by the NASA/ESA Hubble Space Telescope, appears to float serenely in the depths of space, but this apparent calm hides an inner turmoil. The gaseous envelope formed as the expanding blast wave and ejected material from a supernova tore through the nearby interstellar medium. Called SNR B0509-67.5 (or SNR 0509 for short), the bubble is the visible remnant of a powerful stellar explosion in the Large Magellanic Cloud (LMC), a small galaxy about 160 000 light-years from Earth. Ripples in the shell’s surface may be caused either by subtle variations in the density of the ambient interstellar gas, or possibly be driven from the interior by fragments from the initial explosion. 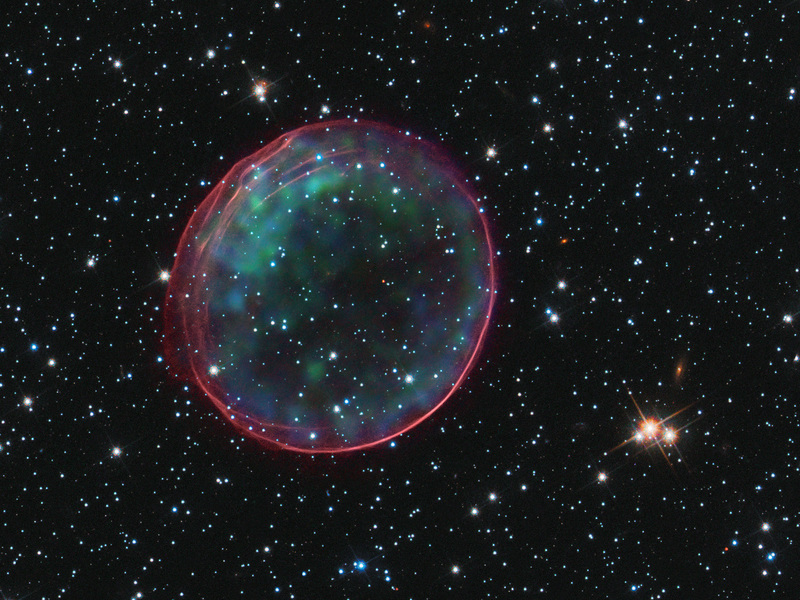 The bubble-shaped shroud of gas is 23 light-years across and is expanding at more than 18 million km/h. Hubble’s Advanced Camera for Surveys observed the supernova remnant on 28 October 2006 with a filter that isolates light from the glowing hydrogen seen in the expanding shell. These observations were then combined with visible-light images of the surrounding star field that were imaged with Hubble’s Wide Field Camera 3 on 4 November 2010, and archival X-ray observations taken by NASA’s Chandra X-ray Observatory. Position (Dec): -67° 31' 18.29"